Google translate app deals 90 different language translation either written or spoken which is available on Apple’s App Store as well as Google Play Store. There is not a sole way to translate languages, you can text to translate, speech to translate along with your camera, by hovering your phone over text. If it sounds pretty impressive already then wait for what the update has to offer. It would not be oblivious to wonder what kind of improvements Google is possibly talking about. Currently on the app you have to manually choose your endpoint language and source which sounds so traditional but right now with the update it can automatically spot what language is being spoken as long as it’s eminent. The recognized language is then translated into text for your ease, reported The Times on Sunday. However, The Times did not specify any languages, yet. It also said that Google will also uncover a feature where any foreign signs will be translated automatically on the screen of your Smartphone. There are many tech giants that provide translation apps such as the Microsoft who offers a Bing translator. Google has delivered us with translation services by many means from its web search results as well as directly through its chrome browser. However, there still exists a need for phone apps which can translate anything immediately yet very accurately as using computers is a technical challenge. Recently, Microsoft launched its Skype translator service on public preview which can translate a two way conversations in near actual time. The New York Times called it a “fundamental miracle’’ however, there were minor errors and mistakes. 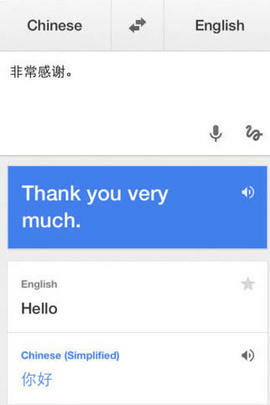 For now, let us stick to the update of the Google Translate app and hope it offers much more than the user desires. Do comment and share your thoughts and insights in the comments section and stay tuned for more news and reviews, coming soon.